When used in this way, the image shows on top of a button widget.The ImageButton inherits image placement from the ImageView widget using android:scaleType. Possible values and how they modify a given image are illustrated in Figure 4.10. Figure 4.10 Example results of android:scaleType for image views. 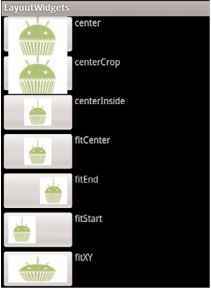 This specifies three different images depending on whether the button is pressed, in focus, or just a normal state.The three different images for these cases should also reside in the drawable resource directory (such as res/drawable-mdpi/).Then, the selector file can be specified as the android:src of an ImageButton. When multiple image buttons are placed together in a layout, it is often useful to utilize the table layout, which is also shown in this recipe. The TableLayout view group is similar to a LinearLayout with vertical orientation.Then, multiple rows can be specified using the TableRow view group for each row. The example layout shown in Listing 4.15 specifies an ImageButton and TextView view in each row, producing the screen layout shown in Figure 4.11. <?xml version="1.0" encoding="utf-8"?> <TableLayout xmlns:android="http://schemas.android.com/apk/res/android"
<ImageButton android:id="@+id/imagebutton0" android:src="@drawable/android_cupcake" android:scaleType="fitXY" android:background="@null" android:padding="5dip" android:layout_width="wrap_content" android:layout_height="90dip" /> <TextView android:text="Cupcake"
<ImageButton android:id="@+id/imagebutton1" android:src="@drawable/android_donut" android:scaleType="fitXY" android:background="@null" android:padding="5dip" android:layout_width="wrap_content" android:layout_height="90dip" /> <TextView android:text="Donut"
<ImageButton android:id="@+id/imagebutton2" android:src="@drawable/android_eclair" android:scaleType="fitXY" android:background="@null" android:padding="5dip" android:layout_width="wrap_content" android:layout_height="90dip" /> <TextView android:text="Eclair"
<ImageButton android:id="@+id/imagebutton3" android:src="@drawable/android_froyo" android:scaleType="fitXY" android:background="@null" android:padding="5dip" android:layout_width="wrap_content" android:layout_height="90dip" /> <TextView android:text="FroYo"
android:src="@drawable/android_gingerbread" android:scaleType="fitXY" android:background="@null" android:padding="5dip" android:layout_width="wrap_content" android:layout_height="90dip" /> <TextView android:text="Gingerbread"
Figure 4.11 TableLayout of ImageButtons and TextViews. How to maintain position of imagebutton android? How to get table in android xml with img button? How to insert image in table layout in android? How to use images button in table form in android? HOW TO INERT IMAGE IN THE TABLE IN ANDROID?